Growing up, there were lots of singles in my house but very few albums. When I got old enough to start buying my own records at the tail end of the '60s, I needed to play catch-up. For example, my first Beatles album was the then-current Abbey Road, but of course no record collection would be complete without Revolver, Sgt. Pepper and so on. And so it was with the Moody Blues. I was a fan throughout my college years and ultimately owned five or six of their albums. All had been out for years by the time I bought them, since the band was on hiatus in the mid-'70s. 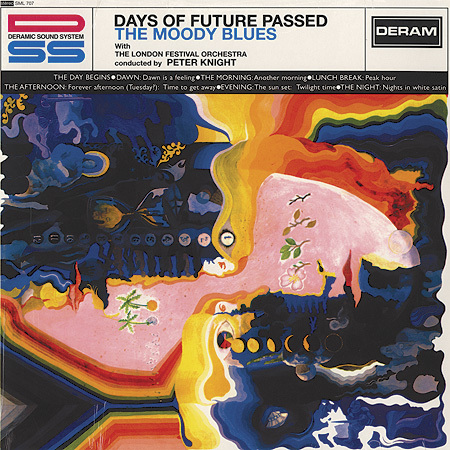 My oldest Moody Blues album was their second, 1967's Days of Future Passed, recorded with the London Festival Orchestra and featuring the classic "Nights in White Satin." "Nights in White Satin" was released as a single in 1967 but did not enter the pop charts until almost five years later, when it rose to number 2. By the time it appears in Cusp, it is three years after that. Karen and Mark, their friendship deepening, talk in front of his house under an oak tree. To lyrics like "Just what you want to be, you'll be in the end," they imagine their future - and how much larger that tree will have grown. The Moody Blues, and being with a kindred spirit, can inspire such philosophical ruminations.